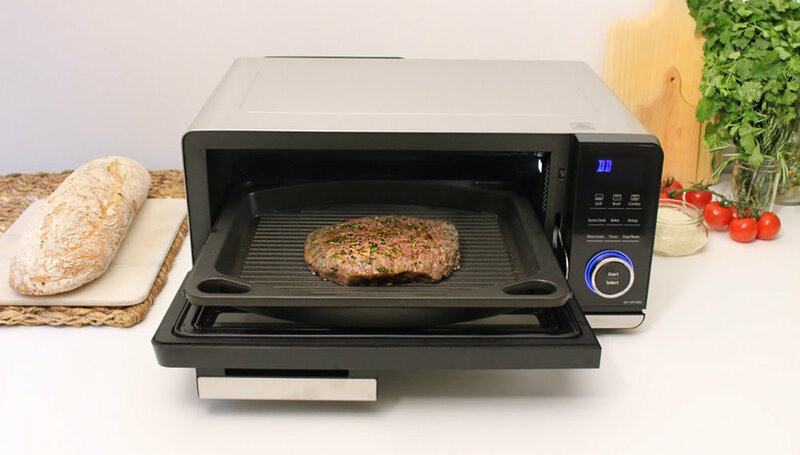 After traveling to Napa California to see demos of the new Panasonic CIO—aka Countertop Induction Oven—in action (read all about that trip and see photos, here), I absolutely could not wait to get my hands on one of my very own. When I finally did, I was super duper giddy. You should have seen me with an ear-to-ear smile on my face while I was opening the box, pulling it out and placing it in its new home out on my counter. I was almost, shall we say, too excited. You know I wanted to play around with all of the modes, so I developed this recipe where I could play around with a few to get myself acclimated to my new kitchen friend. I started with the "grill" mode, with a click of a button moved to "bake" and then to "broil"—and, all in this one perfectly sized device. The part I love the most is that I was able to do all of my cooking in a single pan. Talk about easy cleanup! It's entirely safe to say, I'm obsessed with #myCIO! Funnily enough, I'd love to tell you more, but the Panasonic CIO is so easy to use there's not much to delve into. Hmmm. Let's see. It comes with a great cookbook filled recipes created using the CIO to help get you playing with it. I know, I'm raving. I'm not the only one! The Panasonic CIO is at CES 2017—aka Consumer Electronics Show—in Las Vegas to be showcased as one of the year's most innovative and world-changing technologies. The whole world is raving! Check it out in the behind the scenes photos of CES on Instagram at the hashtag #CES2017. Get yours STAT! Available online at Williams-Sonoma, Bed Bath & Beyond, Amazon and Panasonic. 1. TO GRILL YOUR FLANK STEAK. turn your Panasonic CIO onto the "grill" mode and turn it to its high setting. In the meantime, on your plate liberally coat your flank steak with your salt and pepper. Press it all in with your hands. Flip it over and repeat it on the other side. Drizzle your olive oil over your seasoned flank steak and rub it in using your hands. Sprinkle the top side of your seasoned flank steak with your finely chopped rosemary. Transfer your seasoned flank steak onto your Panasonic CIO grill pan and put close it into your Panasonic CIO. Use your metal spatula to flip your flank steak. Grill for an additional 5 minutes. Let it sit in your Panasonic CIO for 3 minutes. Transfer your flank steak to your clean plate. 2. TO MAKE YOUR GARLIC BREAD. Turn your Panasonic CIO setting to "bake" mode and turn the heat to 375°. In your medium mixing bowl, mix together your butter, parsley, and garlic. Spread your mixture evenly over the cut side of your halved ciabatta. Put your ciabatta in your Panasonic CIO for 10 minutes. Sprinkle a tbsp of your grated Parmigiano Romano evenly over your baked ciabatta. Turn your Panasonic CIO to its "broil" mode. Put your ciabatta back in and broil for 1 minute. Using your metal spatula, transfer your garlic bread to your cutting board. Put your 4 cherry tomatoes in your small mixing bowl. Add 1 tbsp of your olive oil, salt, and pepper. Place your cherry tomatoes on your Panasonic CIO grill pan and broil them until softened—about 2 minutes. 3. TO ASSEMBLE YOUR OPEN-FACED SANDWICH. 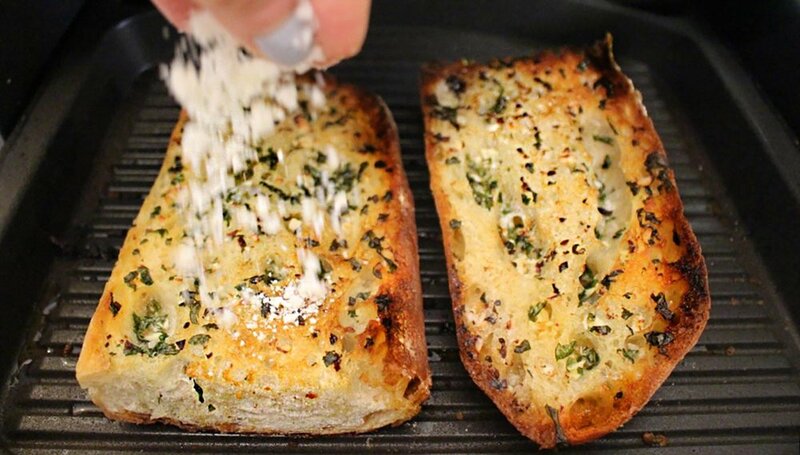 sprinkle 3/4 of your arugula over your garlic bread. Add on 3 rings of your red onion on top of your arugula. Cut your flank steak into 1/4 inch strips. 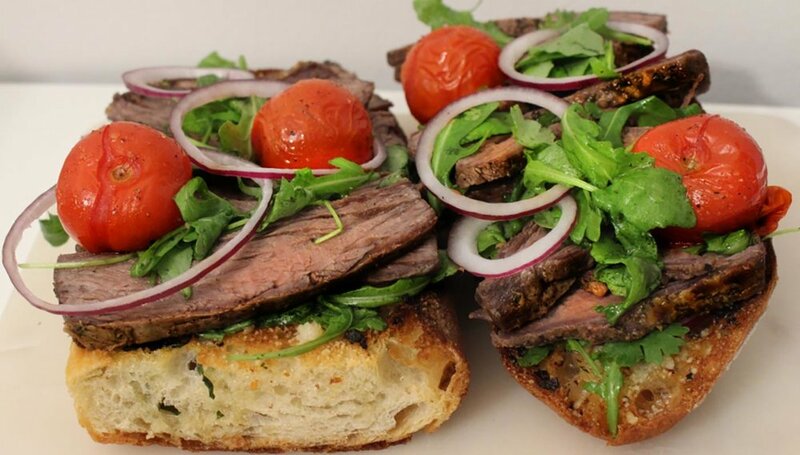 Layer flank steak strips on top of your garlic bread. Sprinkle your remaining arugula on top of your steak. Sprinkle on your remaining Parmigiano Romano.